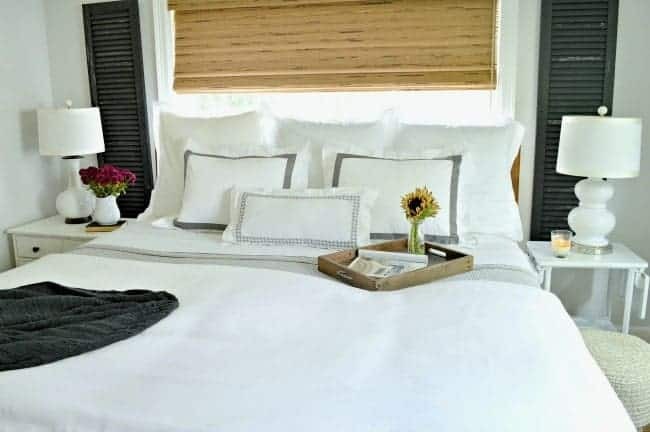 For me, fall always means changing out my t-shirts for sweaters, pulling out my throw blankets and getting the master bedroom ready for cooler weather. It’s nice to sleep on cool, crisp sheets and have minimal bedding during the summer months, but I always look forward to the change of seasons. Not only am I ready for a change in decor, but it also allows me to create a cozy bedroom for us to enjoy during the fall months. Whether your space is large or small, turning your bedroom from summer fresh to fall cozy doesn’t have to be difficult. 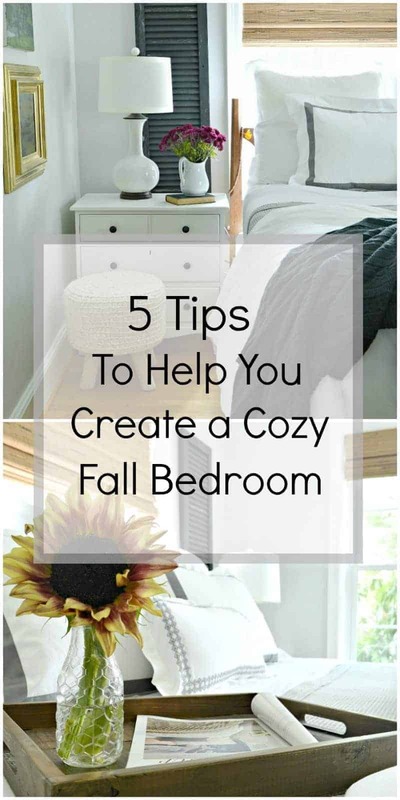 Here are my 5 tips to creating a comfortable and cozy bedroom for fall. 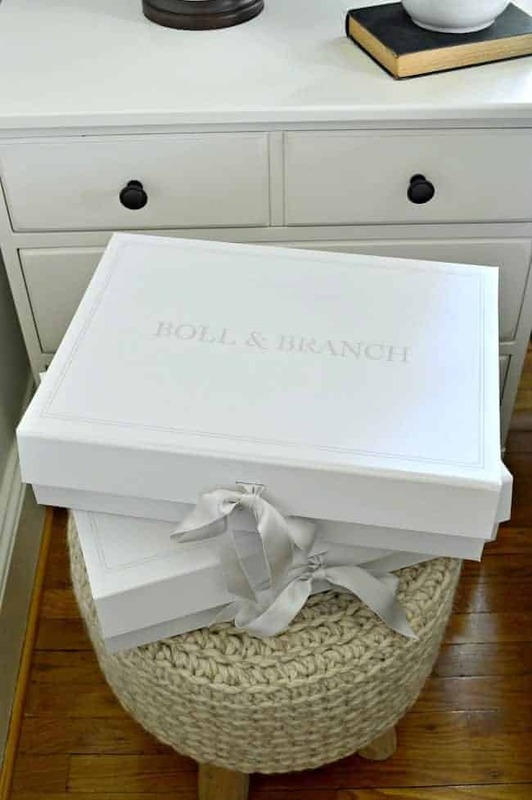 *This is a sponsored post written by me on behalf of Boll & Branch. All opinions are 100% my own. Texture – Introducing texture to your room instantly adds style and dimension. A couple of ways to do this with a rug, a small knitted ottoman or a pretty cable knit throw. 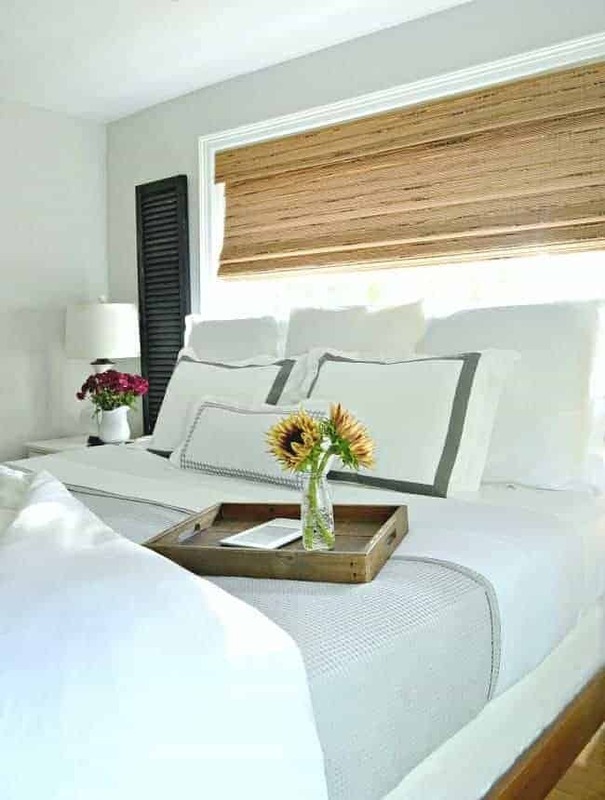 Dressing your bed with beautiful linens – I admit it, I am one picky customer when it comes to the feel and quality of my sheets. After all, you sleep on them every night, and you’ll use them for years, so you should love everything about them. 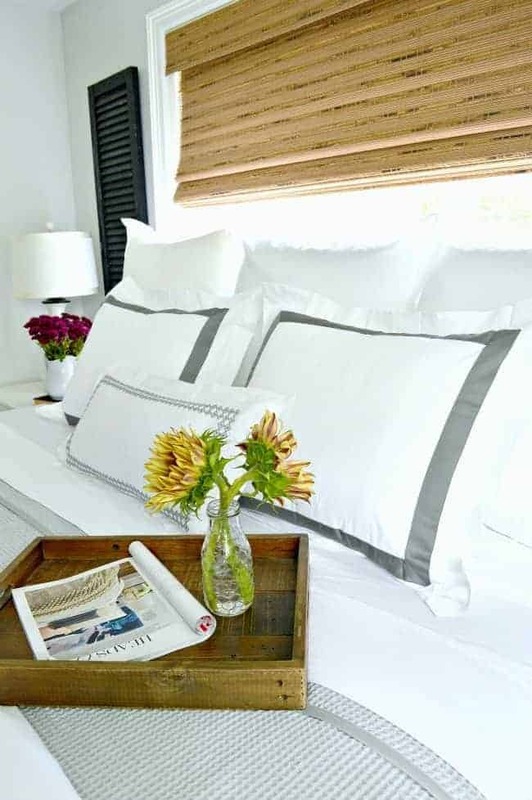 My favorite is crisp white sheets, not only in the summer but even in the fall and winter. I love that they keep the room light and bright, even on those dark and cold days that always come. I usually keep the bed dressed very lightly for summer but I’ll go all out for the fall/winter months. Besides sheets, I always add a light blanket (for cool nights) and duvet (for when it’s really chilly, which is every night for the hubs 😉 ). Adding candlelight and fresh flowers – Changing your bedroom over from summer to fall doesn’t have to be expensive or complicated. 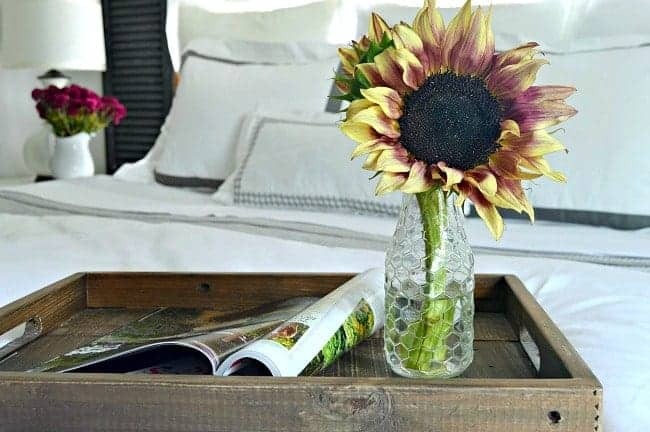 A softly scented vanilla candle (my favorite) and a beautiful sunflower is a quick and inexpensive way to add a touch of fall. Layer, layer, layer – Adding different layers to a space is the perfect way to create coziness in a bedroom. 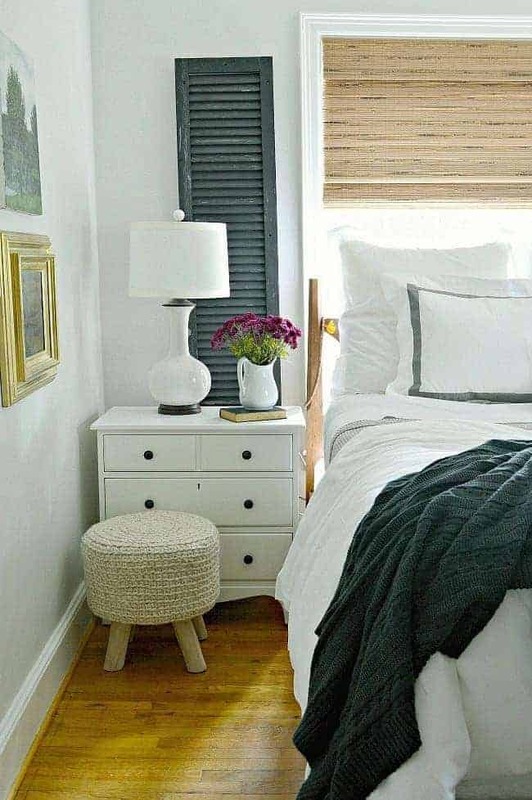 Whether it’s with a waffle blanket in a contrasting color on the bed or a soft rug on the floor, layering is an easy way to add dimension. Not only that but it also allows you to have fun with your decor. Pillows! – Who doesn’t love pillows? One or two, or twelve. Ok, twelve is a little much, but piling on a few pillows is sure-fire way to create a cozy bedroom. I added 3 euro shams, 2 standard shams and a lumbar sham to our bed. I also chose the banded shams and an embroidered lumbar sham to add some contrast with all the white. Here’s my quick tip for using euro shams. If you like to use them but don’t want to buy, and ultimately store, a euro pillow, you can use two standard pillows. Used together they are the right size for the euro sham. It’s what I used in 2 of the 3 on my bed. Snuggling up to a cute pup while relaxing in your comfortable and cozy fall oasis may just be the best way to enjoy your space. We’ve been sleeping on our new sheets for a few weeks now and they are truly the most comfortable sheets we’ve ever had. They even meet my picky standards. Opening the package was a treat, too. All the linens were beautifully packaged and wrapped in pretty boxes, that you can reuse. Now that the master bedroom is ready for fall, I can work on the rest of the house. What do you do to get your bedroom ready for the cool nights of fall? 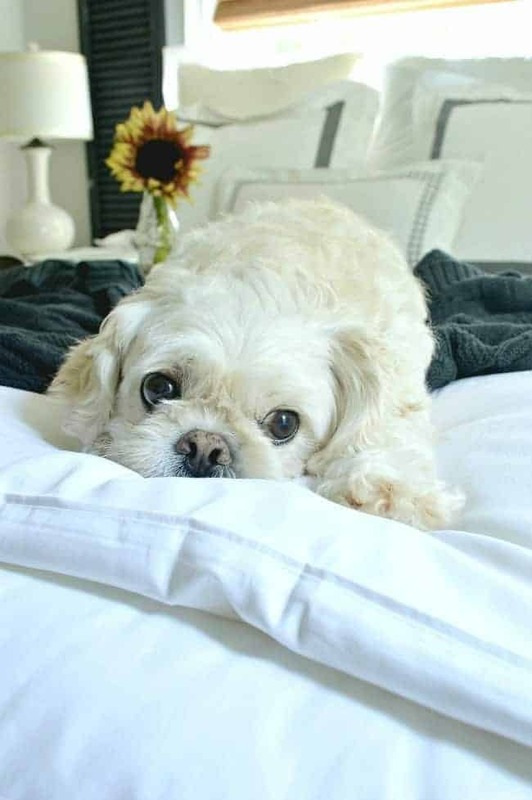 Very pretty bedroom–I love the linens and your adorable puppy! Thanks so much Lisa! I don’t have a lot of space to decorate in our small bedroom so dressing the bed for fall was fun. This looks so pretty! I love your new bedding with the shutters on the wall and your woven shades. I love all the colors and textures especially for fall. The cable blanket is so nice! Such a beautiful color! Fall is in the air here in PA. Thanks so much Julie! It’s tough to decorate such a small room so I try to add a lot of texture. Fall is in the air here as well. So unusual for North Carolina but I’ll take it. Your bedroom is beautiful! I’m in the midst of redoing my bedroom. I was in desperate need of new dressers and I couldn’t decide what to do. Buy a brand new bedroom set (which I didn’t really want to do for personal reasons) or just certain pieces. Since I had a Thomasville secretary already and a nice little (what my mom used to call a bachelor’s chest). I guess because it was smaller than the norm, all I needed was a tall chest of drawers. I ordered one from Wayfair and I’m just waiting for it to arrive. Anyway, I have to remove wallpaper and paint yet, but I’m anxious to get it all done. Just wanted to tell you, I love your new home! It has that cottagey feel that I love so much. I bet it is going to fantastic for Christmas! Thanks so much MJ. It’s a very small room but comfortable enough for the two of us. We are learning to live in an even smaller space, than our Illinois home, but it has been fun putting it all together. A ton of work, but fun. Sounds like you are busy with your own bedroom. Best of luck on your redo. Can’t wait to hear how it turns out. Hope you are doing well. Have a great weekend! Well your pup sure seems to be ready for a comfy fall! 😉 Beautiful! Soft flannel sheets for me and especially my hubby! So I do have to wait a little later until nights are quite a bit cooler. I also change to fall comforter, bed ruffle , shams, etc. (And since I have a king size bed, that is quite an ordeal). I like your idea of the same bedding and just changing pillows, blankets, flowers, candles, etc. My new plan……thanks for the idea! Such a cutie to snuggle with, talking about your bedding and pillow made me sleepy,lol! Your bed is so dreamy. I appreciate your visit. Hope you have a great day! Kristi, Thanks so much for the tip about Euro pillows; now I can use the ‘company pillows’ and don’t have to buy extras. 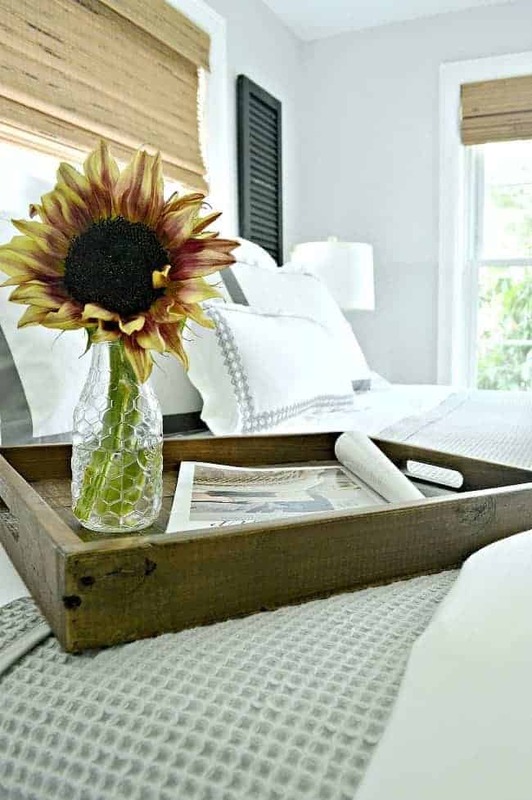 Love the sunflower & vase – adorable! 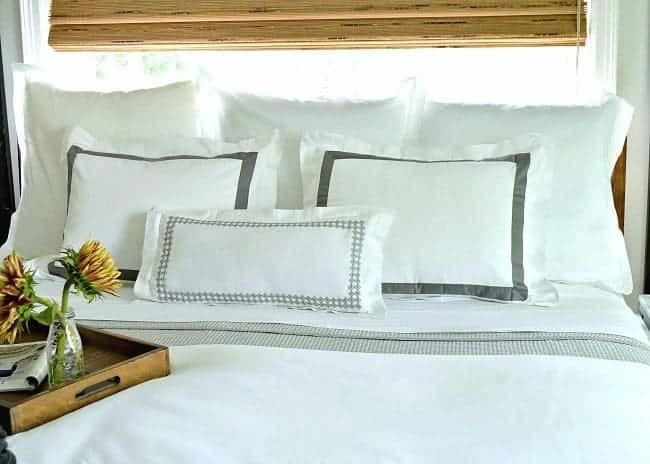 Kristy, I’ve been hearing so many commercials for Boll & Branch and your fall bedroom certainly gives me a good idea of how nice the linens actually are. Your fall bedroom update certainly looks cozy and beautiful! I love the photo with your fur baby too! Thank you for sharing!! Thanks Kaycee! They really are beautiful sheets and I highly recommend them. The room is so small so the bed is the only thing I can work with. I love the fall change though. Thanks for stopping in. Hope you have a great Wednesday! Thanks so much for stopping in. Watching the storm closely and hoping Florida makes it through ok.